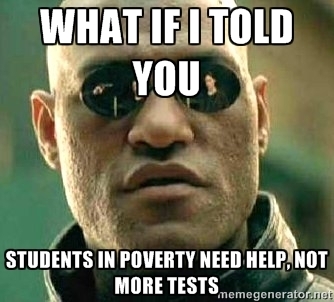 Why is our nation spending hundreds of millions or perhaps billions of dollars on high-stakes testing that will only confirm what we’ve known from decades of this testing: students in poverty, students in special education, and students learning English don’t score as well. Does knowing that get us any closer to actually addressing the national shame of student poverty, far higher than other nations? No. The salespeople don’t care. They want to generate fear and to make their money. Teacher and Oregon Save Our Schools member Kathleen Hagans-Jeskey reports/mocks/slaps down the wasteful absurdity of the Oregon Department of Education and corporate front group Stand for Children: “Smarter Balanced Forum Reveals Weak Arguments of Test Supporters“.